$20.99 Thunder Group CR006YW Yellow Wide Rim Melamine Plate 6-1/2" - 1 doz. $20.99 Thunder Group CR006W White Wide Rim Melamine Plate 6-1/2" - 1 doz. $20.99 Thunder Group CR006BU Purple Wide Rim Melamine Plate 6-1/2" - 1 doz. $20.99 Thunder Group CR006GR Green Wide Rim Melamine Plate 6-1/2" - 1 doz. $20.99 Thunder Group CR006V Ivory Wide Rim Melamine Plate 6-1/2" - 1 doz. An excellent choice for any table setting, the Thunder Group CR006PR Pure Red Round Wide Rim Plate 6-1/2" is perfect for entertaining or everyday dining. 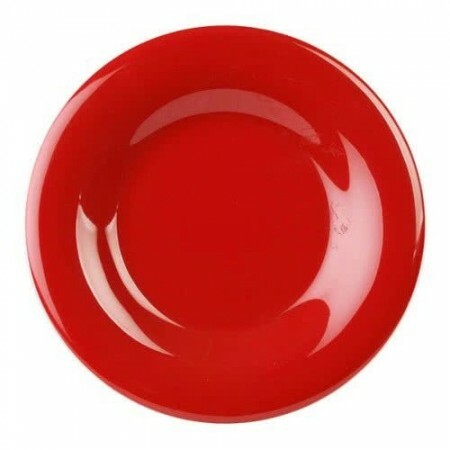 This vibrant, pure red plate stands out as part of any table setting. Made from melamine, this NSF approved heavy-duty plate resists heat, stains, and breakage. For easy cleaning and maintenance, this wide rim plate is dishwasher safe.